A few years ago I saw a report about a company in Japan that had released a computer keyboard based on the key configuration used by mobile phones. The rationale for the product was that Japanese students had become so adept at typing on their phones that they preferred that sort of keyboard for writing their school papers. I’m nowhere near that slick on a traditional mobile phone keyboard and, in fact, I would welcome a more improved version. 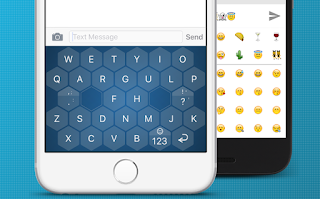 And that’s what a Swiss startup company is offering with the WRIO Keyboard. WRIO (write it once) incorporates gestures with an optimized key layout that lets users do error-free typing and do it 20-70 percent faster compared to a conventional keypad. The WRIO keypad was funded with a Kickstarter campaign and will be available soon for both Androids and iOS devices. The WRIO keys are larger than those on traditional keyboards and are arranged hexagonally, which makes them easier to reach with thumbs and fingers. The layout also includes two centrally located space keys and special characters that are noticeably faster to reach. The WRIO system has an intelligent auto correction feature (unlike auto-correct on my phone, which never seems to be especially smart) and the Android version will adapt to individual typing behavior to further minimize errors. All details about the WRIO are available on the WRIO Keyboard website.